Like the tap on a drum, a dancer landing a jump or balancing on point exerts a downward pressure that spreads outward in waves from the point of impact. If a floor is designed to meet those impact waves, the result is like the "ping" of the drum, offering support and dynamic response. If not, the result is flat, lifeless, a "thud." Wooden Kiwi Productions, in collaboration with designer and woodworker Andrew Pate have developed our floor systems to promote the "ping." The principle behind the kiwiFLOOR is the same as that of the drum. It is a continuous diaphragm sprung on pads of closed cell foam, designed to oscillate within a rigid perimeter. 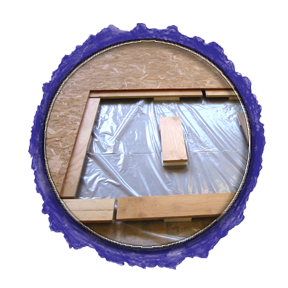 By varying the size and orientation of pads and employing close supervision and careful finishing at installation, the kiwiFLOOR offers an exceedingly versatile dynamic response that eliminates all of the problems of existing integrated panel systems: no more stress concentrations or "hot spots"; no more dead response damping; no more material voids; and no more expensive installation costs, that have plagued dancers and dance studio owners. Originally developed for the Green Street Studios, in Cambridge, Massachusetts, the kiwiFLOOR Studio system has been improved and installed in many dance facilities, including Emerson College, Festival Ballet, and the Flynn Theatre. The response has been highly enthusiastic from both dancers and studio owners. We offer full installation services, as well as a license and kit of parts for other contractors, or do-it-yourself studio owners. See a LIST of kiwiFLOOR clients.